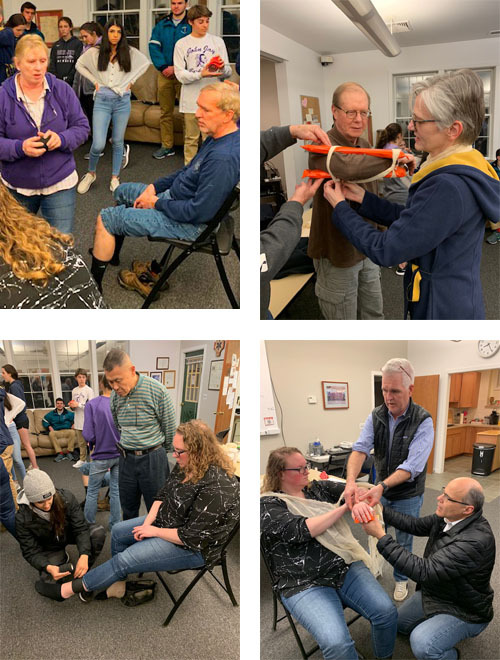 LVAC Assistant Captain Judy Saslow ran a "Full Splinting" drill prior to 2019 Leatherman Race in Pound Ridge Reservation. 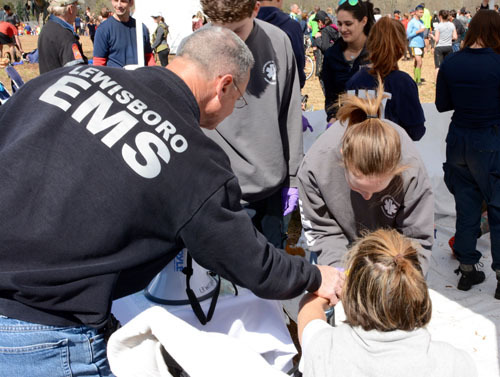 All members participated at three stations where different limb injuries were simulated. 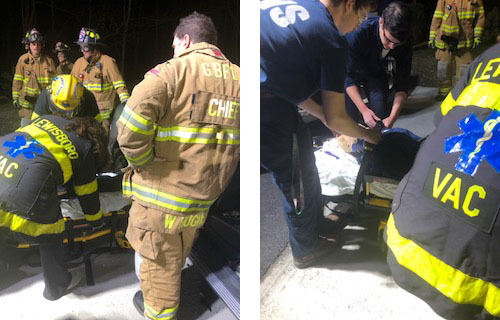 Included in the scenarios were bleeding control along with ankle and arm injuries where LVAC members applied dressings and sling and swatch stabilization techniques. The Leatherman Race is conducted in wilderness settings where soft tissue and musculoskelatal injuries are common. LVAC Junior members are tasked with being the primary care givers as part of their professional development. 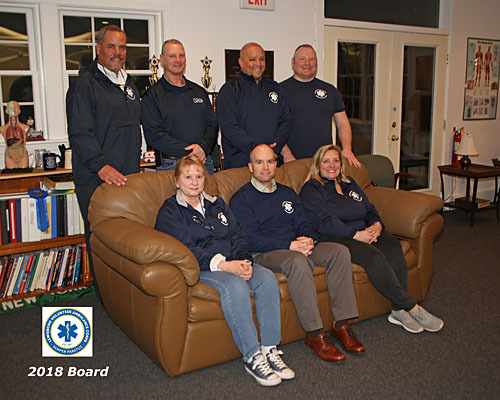 2019 Board Members include (l to r) Captain Dan Murtha, President Jim Reilly, Vice President Mark Sheeran, Assisitant Captain Judy Saslow, Director Mike Kis, Treasurer Mike Keech, and Secretary John McKeon. 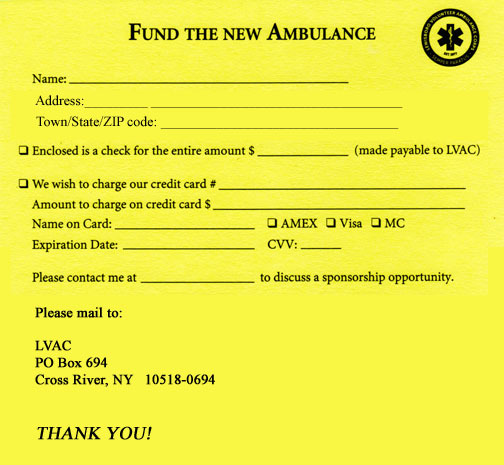 LVAC NEEDS YOUR HELP IN FUNDING OUR NEW AMBULANCE! We really need your help right now! Our older ambulance, having made over 3000 runs, suffered an uninsured catastrophic electrical failure a few months ago. It was at the end of its service life and frankly it made no sense to repair it. We have placed an order for a new ambulance which will cost us in excess of $250,000 when fully equipped. Unlike our previous rigs, it will be equipped with four-wheel drive, which will allow us to operate efficiently in all kinds of weather, particularly snow and ice. Even when the power is out and the roads are snow-covered, when you need help, you can depend on LVAC. Can we depend on you? Please consider donating generously to help fund the new ambulance. Thanks so much for supporting your communitys ambulance service. 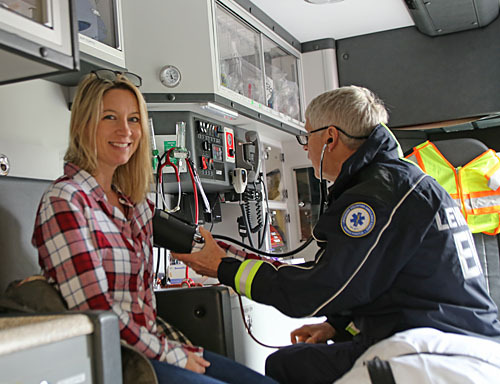 South Salem resident Allie Bickler has her blood pressure taken by LVAC EMT Mark Sheeran at South Salem Fire Department's Annual Open House on October 13, 2018. 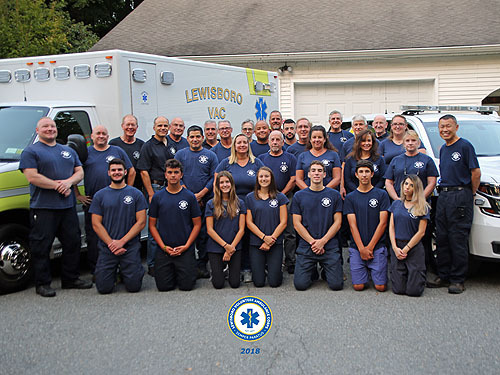 When you call 911 for emergency medical help, this is the team of dedicated volunteers who will show up at your door to help you in your time of need - 24/7/365. 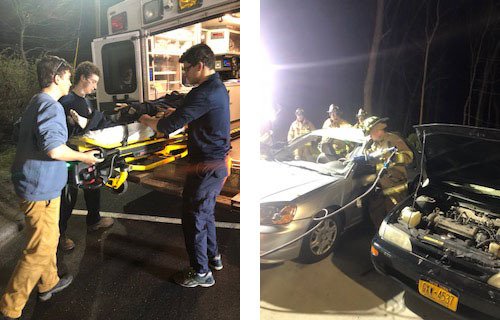 On May 8, LVAC performed a joint drill on automobile extrication with the Golden's Bridge Fire Department. LVAC members participate in two drills every month on various topics. 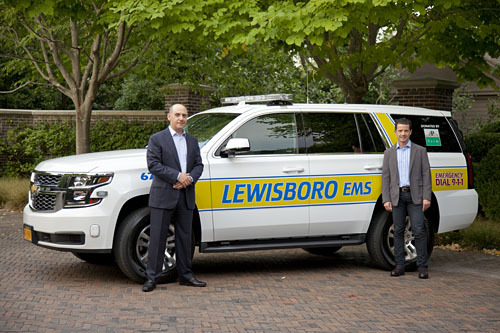 The Lewisboro Volunteer Ambulance Corps (LVAC), the Town of Lewisboro's all-volunteer and community supported emergency medical service provider, received a new and fully equipped sport utility vehicle to serve as a "fly car" for rapid response to emergencies. A fly car allows EMTs to respond swiftly and to triage patients prior to the ambulance, which would then transport patients if necessary. 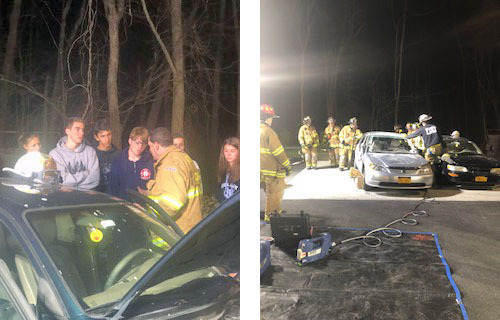 The fly car was donated by Adam R. Rose and Peter R. McQuillan, longtime Lewisboro residents, prominent philanthropists, and owners of AP Farm in Cross River. Known in the community for their donation of the AP Farm Athletic Fields to the Katonah-Lewisboro School District, the married couple has supported local, regional, and national causes for over two decades. The Lewisboro Library, the Jacob Burns Film Center, and the Westchester Land Trust are just a few organizations that have benefited from their generosity. "We can think of no local organization that expresses the selflessness and caring for our community more than LVAC. Peter and I are extremely proud to be able to present LVAC with this handsome and greatly needed vehicle," said Rose at the LVAC Gifting Ceremony held on September 6th. 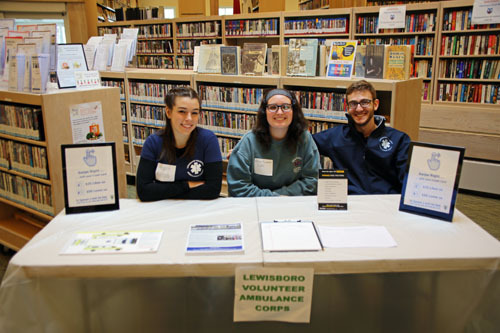 "Adam and Peter have made an incredibly generous gift that will enable LVAC to reduce care response time and to maintain our status as one of the most highly trained and skilled all-volunteer ambulance services in the region," said Lucian Lipinsky, Captain of LVAC. "We are humbled by their commitment to the health and safety of their community." Mr. Rose and Mr. McQuillan presented the gift at the LVAC meeting of the organization on Tuesday night September 6. 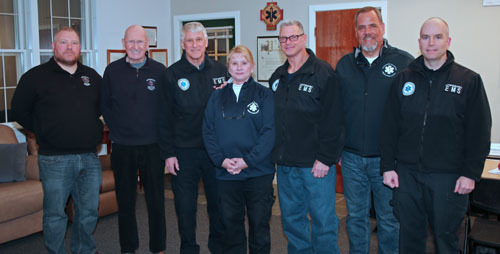 Members of the Lewisboro Town Board and representatives from some of the volunteer fire companies in town attended the presentation. Ann Hirsch, President of LVAC, commented that "With an increase in monthly calls (last month was a record high of 52) it is critical that our fleet of vehicles be ready for action. This new fly car will greatly support our work. We encourage others to follow Adam and Peter's example. They have previously made a substantial donation to the purchase of our ambulance, but this is only the second time in our 30 year history that someone has donated an emergency vehicle outright. Look for the AP Farm Fly Car at community events."